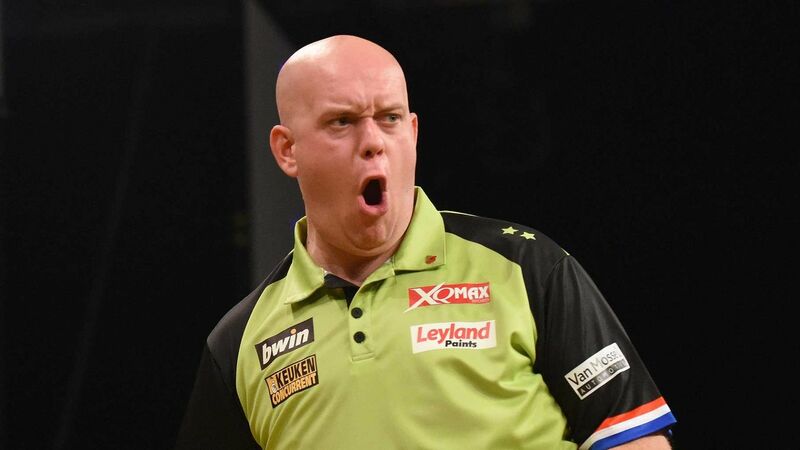 MICHAEL VAN GERWEN defeated Michael Smith 10-8 in one of the best matches ever seen at the bwin Grand Slam of Darts on Thursday in Wolverhampton. Reigning champion Van Gerwen, who is bidding for a record-breaking fourth successive title, booked his place in the quarter-finals with a stunning 108.32 average as the eight players who qualified from Groups A-D returned to the stage at the Aldersley Leisure Village. Former Grand Slam semi-finalist Smith led in the opening stages of the Premier League final re-match before Van Gerwen, who landed an incredible 11 180s, took the lead for the first time at 5-4. With the world number one leading 9-8, Smith missed a dart at double top for a 160 finish and Van Gerwen punished to march on to the last eight where he will take on Jonny Clayton in a repeat of their high-class Group A contest. 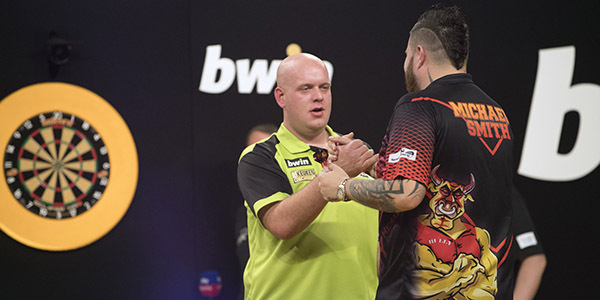 "It was an incredible game against an incredible player who produced some great darts but I did the right things at the right moments," said Van Gerwen. "I played so well but at times I thought I wasn't going to be able to break his throw but I love playing games like this for the crowd, this is why we play darts. "I want to keep playing to this standard for the rest of the tournament and I want to win." Clayton produced a magnificent performance to brush aside Poland's Krzysztof Ratajski 10-3. Welshman Clayton ended Van Gerwen's 21-game Grand Slam winning run in the group stage in dramatic fashion, and continued his run thanks to a magnificent 103.65 average. "This is massive for me, I'm loving every minute of my time spent in this tournament," said Clayton. "Anything beyond the group stage is a bonus for me, I just wanted to make sure I kept straight and thankfully I managed to play really well again so I'm delighted with that." 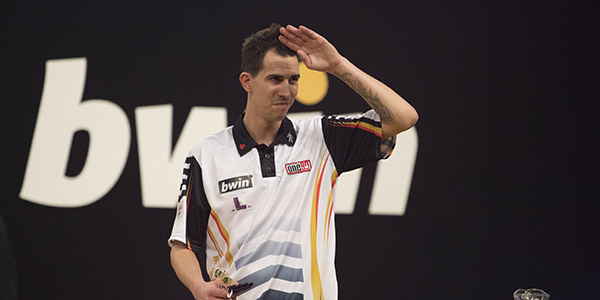 Michael Unterbuchner caused one of the biggest upsets of this year's tournament by dumping out European Champion James Wade. 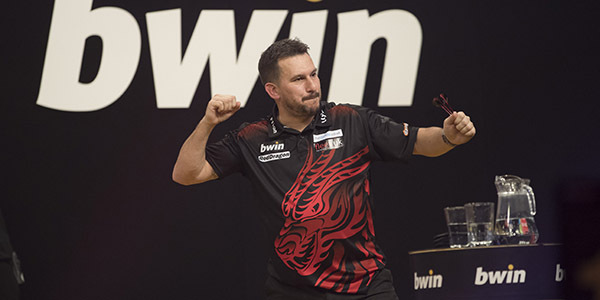 German BDO qualifier Unterbuchner claimed a 10-6 victory to book his place in the quarter-finals and end Wade's hopes of a third successive televised title and set up a meeting with Gary Anderson. Wade was hoping to extend his winning run on TV to 14 matches but Unterbuchner punished his misses to upset the odds and claim a famous win. "It's unbelievable to beat James Wade, such a fantastic player on this amazing stage," said Unterbuchner. "I booked my flights home for tomorrow morning because I didn't think I would win but I don't mind staying longer, hopefully until Monday!" 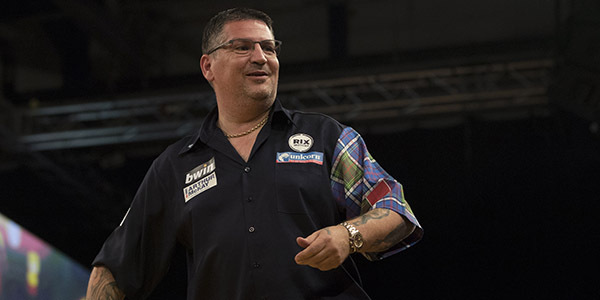 Former runner-up Anderson continued his quest for a first title in Wolverhampton, seeing off Dutch BDO qualifier Wesley Harms 10-2 with a ruthless display. World Matchplay and UK Open champion Anderson took a narrow 3-2 lead into the first break but blew away the Lakeside Championship semi-finalist, ending the contest with six 180s to his name. The knockout stage continues on Thursday with the first two quarter-finals taking place, as nine-dart hero Dimitri Van den Bergh takes on Mensur Suljovic and Simon Whitlock faces Gerwyn Price. The tournament will be broadcast live on Sky Sports and through the PDC's worldwide broadcast partners, as well as through PDCTV-HD for Rest of the World Subscribers.